Seavington History Project received a request for information from Mr Brian Murless Hon. Archivist for the Somerset Industrial Archaeological Society (SIAS) the text of which is below. The making of shirts and detachable collars was the last textile industry to be introduced into Somerset during the 19th century. One such entrepreneur was Alfred K. Cook of London whose company operated factories in Chard (Crimchard and Snowdon), Ilminster (High Street and Listers Hill) and the Excelsior Works in Taunton. To this list can be added Seavington St. Michael which appears in Kelly’s trade directories of Somerset for 1897 and 1902. The precise opening and closure dates are currently unknown along with the size of the factory but its location is thought to have been at the south end of Davids Lane near the junction with New Road. Employment would have been provided chiefly for women and girls whose dextrous hands could sew and iron as well as launder. There were sewing machines and gas-powered irons but the ‘wet’ activities such as starching and washing the cotton cloth must have seemed like domestic chores only carried out on a grander scale. 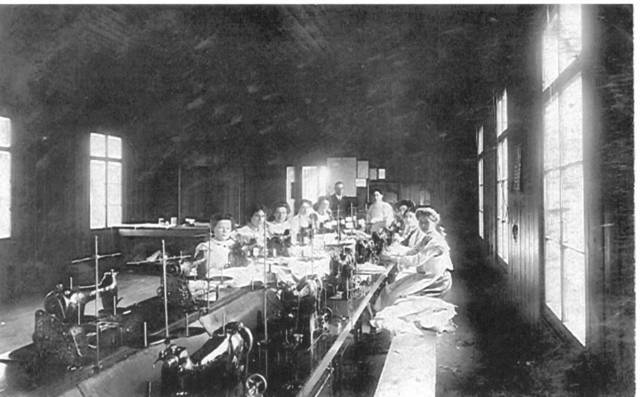 If your family has lived in or around the Seavingtons for several generations you may have had a grandmother or great grandmother who helped to make collars and shirts. It is also possible that photographs survive of both the workforce and the factory building. (These have now been supplied by Michael Harrison). The building looks as though it was either purpose built with expansion in mind or the collar company had taken over an existing premises. It could be timber-framed like a scout hut. 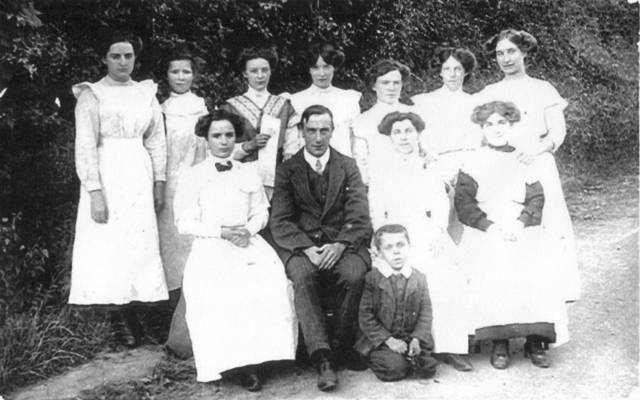 I suspect, though, that the workforce was always relatively small (as in the pictures) and with a focus on stitching such as button holes. The machines are almost certainly by Singer and I note that some ladies look like they’ve just finished school. If they’re part time then strict rules would govern their hours of employment. There is now the exciting possibility of putting names to faces, trying to date the photos and, through say the Census of 1901, the ages of the employees. If you can help please get in touch Ry Coffman or Carolyn Farler so that any more stories or pictures could be on the website as part of the History Project. Phone numbers: Ry 01460 240004, Carolyn 01460 249192.